I have posted before about our Learning Tower, which has been the greatest investment and tool for learning. It stays in our kitchen and I try to have activities for them waiting on the counter at the top of the tower. So when they climb up they find a project to work on. These two have been my recent go to projects. This activity is from Confessions of a Homeschooler. This website has an unlimited supply of amazing printables all for free. Or if you want to download all of her PreK curriculum all at once it's $10.00. Then all you need is a Thermal Laminator, which is just a good investment no matter how you look at it. I got mine for a Christmas present. It's not actually that much of an investment at around $30.00 on Amazon. The laminating pouches are $11 to $15 or so for 100. The price does seem to fluctuate a bit on the pouches, not sure why. This activity has been a huge help for Lachlan to learn what the numbers actually look like and to recall them from memory. He counts the number of objects on the card, then has to clip a clothespin or paper clip to the correct number. The numbers listed on the side aren't in order so they really have to look at each and know the number to get it right. If the numbers were listed in order, 4, 5, 6, then if he knew 4 he could assume the next one is 5, because they aren't in order I can be confident he actually recalled the number from memory when he gets it right. This activity is also great for the little ones I care for and my little Peter. 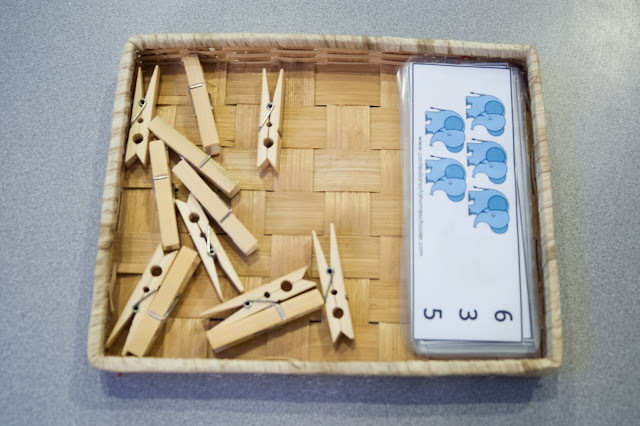 For them they just use the activity to clip the clothespin to the card, great for developing fine motor skills they will need for writing some day. Peter can count so I think I might work with him on this activity to count with him and then show him the correct number to clip it to. This was an idea I got from FunShine Express for one of the letters we were learning. I think I did it first with the letter "I" but I used a newspaper. I quickly realized there are not that great of stories and pictures in the grown up newspaper. 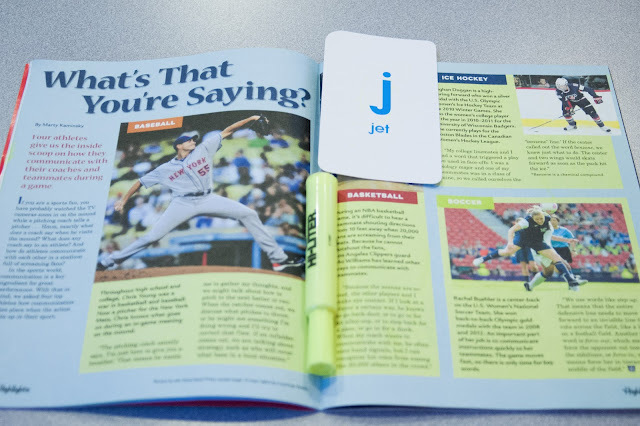 My friend Kathy got us a HiFive subscription as a gift and it dawned on my that this would be a great resource for letter hunts. I pulled out my set of flash cards that just have either the lowercase or uppercase version of each letter on the cards so they can just focus on searching for one type at a time. There are a lot more lower case letters in the world then uppercase so I chose to use the lowercase. I just put the flashcard of the letter we are looking for and the highlighter in the magazine and keep it out as a quick activity to grab when I need to get him started on something while I get together something else to work on next. 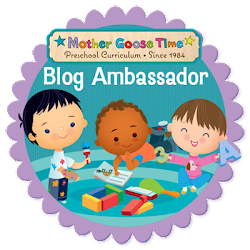 If you find my blog posts helpful and you decide to make a purchase at FunShine Express please select my blog name in the referral section when you check out. We are so thankful for any help we get towards the expense of our boys education. This is very helpful information! Thank you! Are you using the PreK curriculum from Confessions of a Homeschooler? I use FunShine Expresses Fireflies curriculum mostly. They have a schedule of working through the basics of letters and numbers plus fun themes to explore. But for $10 I just couldn't pass up all this amazing stuff. I am also working through FunShine a little different then it was intended so because of that I feel like sometimes we just brush over a new letter or number. That's when I pull from Confessions of a Homeschooler to fill in and add to. FunShine offers a lot of crafts, deep imaginative play, science ideas, puzzles, physical exercise, rhythm and songs and introduction to numbers and letters. Many of the lessons around the numbers have you count to that number, showing them the number and teaching them the Spanish word (which I love). Lachlan has always been really good at counting though. But really had no idea which written number was which. So this hand on activity where you aren't just shown the numbers but interacting with them in this way has really helped him. The challenge of clipping the clothespins to the number keeps him motivated enough to work through quite a few numbers before he calls it a day. Anyhow, the main question you asked me was which curriculum from Confessions I use. I downloaded the Letter a Week curriculum and this is what I use to fill in and add to FunShine Express. I also have subscribed to the blog because she has new stuff come up all the time. I have started quite a collection of K4 from her site as well.